The Nexus 4 was lost in a bar… Why is this so familiar? If you don’t feel like looking for a Google phone in a bar, check out our review of the Google Nexus 4. Turns out Apple isn’t the only one who knows how to lose a smartphone in a bar because it looks like someone at Google did the same thing. To refresh your memory, a man named Brian Hogan found an iPhone 4 prototype in a bar left behind by an Apple engineer. Hogan ended up selling it to Gizmodo for $5,000 and consequently ended up in a lot of trouble. This story ends a little differently. The bar this time around was the 500 Club in San Francisco. It happened on a Tuesday of last month. Jamin Barton, a bartender nicknamed “Sudsy”, found the phone while closing. At first, he didn’t think anything of it. But this particular phone didn’t seem like the others. Nobody came to pick it up and Barton noticed quite a few peculiar features like a lack of SIM card and a “not for sale” sticker accompanying a Google logo on the rear panel. Once he showed it to fellow 500 Club employee, Dave, it was confirmed to be the upcoming Nexus 4. The Nexus 4 is the smartphone Google was planning to unveil in New York on October 29, but that event has since been cancelled due to Hurricane Sandy. 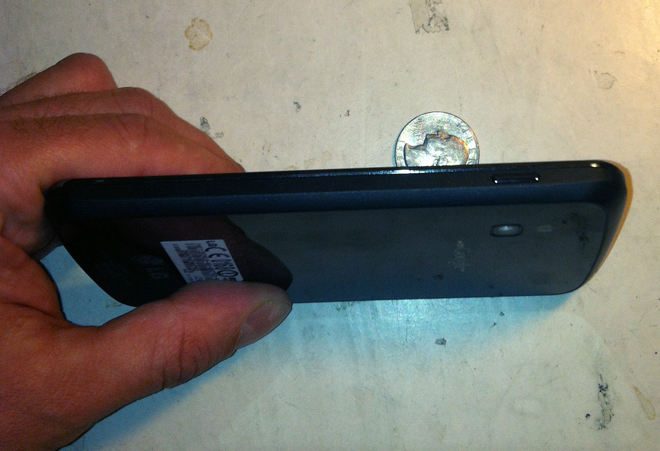 And, we might add, every detail about the Nexus 4 has already been leaked, including photos of the device. It will be manufactured by LG and have a 4.7 inch display, a quad-core processor, and ship with Android 4.2. If it was meant to be a secret then Google clearly dropped the ball. Dave took over from there, offering to call Google HQ and explain what had happened. And much like Apple, Google blew the whole thing out of proportion. Brian Katz, Google’s global investigations and intelligence manager, was sent to the 500 Club almost immediately. Dave assured Google that Barton would hand over the phone as long as whoever picked it up confirmed their affiliation with Google. Long story short, after some drama involving a riot and the local police station, Dave handed the phone over to Katz. In exchange, Katz offered Barton a free phone if he would agree to keep the incident under wraps and not discuss it with the pubic until after the official announcement. Obviously, Barton refused the offer and was paid a freelance fee by Wired for providing photos published alongside the article. Looks like isn’t the only one that’s lost control of its secrets.